Contracts, coordinates, and effects housing and transportation of prisoners for all court related appearances and activities. Provide security for Courtrooms and Courthouses as required. Serve arrest warrants for both the District Justice and Common Pleas Court. Serve Protection From Abuse Orders (PFA); within Sullivan County and enforce such orders as needed. Serve all civil process for both the District Justice and Common Pleas Court. Process Orders & Writs of Execution and conduct levies & Sheriff Sales in accordance with Pennsylvania Rules of Civil Procedure. Conduct background investigations of applicants applying for a "License to Carry a Firearm," as outlined in the Pennsylvania Uniform Firearms Act. Respond to private citizens request in regard to domestic disputes and community disputes. Provide information to those involved and assist as necessary. Upon request, provide assistance to other law enforcement agencies. Enforce Commonwealth Traffic and Crimes Code violations when committed in our presence. $75.00 Civil Complaints, Writs, etc., for first defendant. Fingerprinting service (ink based) is available. Disposal of old medications is available. If you cannot travel to the courthouse to drop off medications, a deputy can be sent to your home. Please call sheriff's office for arrangements. The cost to renew or apply for the first time is $20.00. Permits are valid for 5 years. Photographs will be taken at the Sheriff's Office. Call the office to verify staff is available to take your picture, and save you a trip. Checks shall be made payable to "Sullivan County Sheriff's Office". Credit Cards may be taken, there is a $1.00 service charge to the card service. Cash payments not accepted. Regardless of the date that your current permit expires, the date that you come in to pick up your new permit will be the NEW effective date. Your physical, (911) and mailing address, if different. Your Driver's License Number. Applications cannot be processed without this number. PLEASE PROVIDE THE LAST FOUR DIGITS OF YOUR SOCIAL SECURITY NUMBER. If you choose not to provide your number, we are required to send your application to the Pennsylvania State Police in Harrisburg for your approval. This will prolong the permit application process. It is STRONGLY recommended to check with the office prior to picking up your License to Carry, as our office sometimes must close to respond to emergencies or assists to other agencies. When scheduled - Sheriff's Sales will be held on the last Friday of the month at 10:00am in the main Courtroom of the Sullivan County Courthouse. A list of current Sheriff's Sales are posted on the wall opposite our office door, and advertised prior to sale in The Sullivan Review. Deputy Sheriff job description and academy physical training requirements provided below. 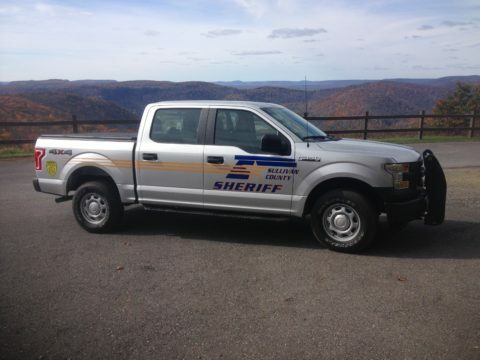 Deputies are normally hired part-time on an as needed basis and hours vary greatly. Sheriff/Deputy Sheriff Academy Physical Training requirements.